Lots Of Seniors Are Overweight, But Few Use Free Counseling For It : Shots - Health News A little-known part of the Affordable Care Act pays primary care doctors to help overweight seniors lose weight. So why aren't more seniors taking advantage of the free weight loss counseling? Anne Roberson walks a quarter-mile down the road each day to her mailbox in the farming town of Exeter, deep in California's Central Valley. Her daily walk and housekeeping chores are her only exercise, and her weight has remained stubbornly over 200 pounds for some time now. Roberson is 68 years old, and she says it gets harder to lose weight as you get older: "You get to a certain point in your life and you say, 'What's the use?' 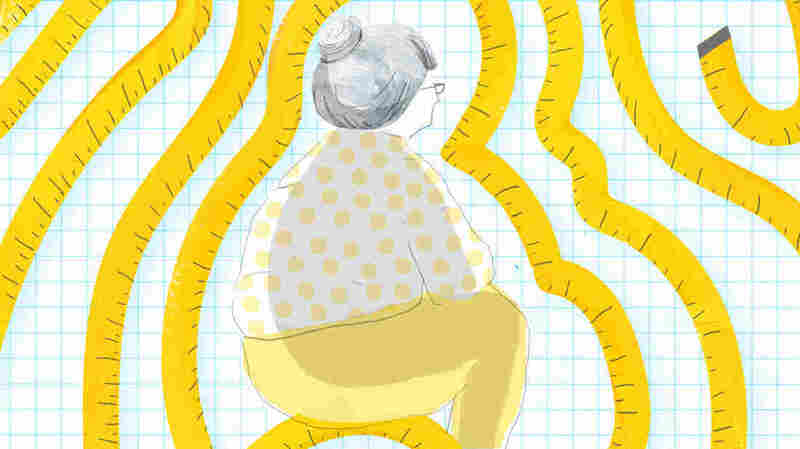 "
For older adults, being mildly overweight causes little harm, physicians say. But too much weight is especially hazardous for an aging body. Obesity increases inflammation, exacerbates bone and muscle loss and significantly raises the risk of heart disease, stroke and diabetes. To help the nation's 13 million obese seniors, the Affordable Care Act included a new Medicare benefit offering face-to-face weight loss counseling in primary care doctors' offices. It is free for patients, with no copay. But while Medicare now pays doctors to counsel their obese patients, only 50,000 people participated in 2013, the latest year for which data is available. "We think it's the perfect storm of several factors," says Dr. Scott Kahan, an obesity medicine specialist at George Washington University. Kahan says obese patients and doctors aren't aware of the benefit, and doctors who want to intervene are often reluctant to do so. Indeed, one study found 2 out of 3 older patients lost 5 percent or more of their initial weight and kept it off for two years. Weight loss specialists say the reason why few seniors are taking advantage of the new benefit is the federal government's decision to limit counseling to primary care offices. "The problem with using only primary care providers," says Bonnie Modugno, a registered dietician in Santa Monica, Calif., "is that they completely ruled out direct reimbursement for the population of providers who are uniquely qualified and experienced working with weight management. I think that was a big mistake." Modugno says she is sympathetic to the government's concerns about widespread fraud — that just about everyone in the weight loss and fitness world wanted to be able to bill Medicare for obesity counseling. But she says doctors should be allowed to refer their patients to registered dieticians like her. "Unless we change the nature of how this occurs, how the counseling occurs, I don't see it being available to people in a meaningful way," says Modugno. The benefit also can't be used by endocrinologists, who might be managing a person's diabetes, or by cardiologists, who monitor patients with heart disease. Both conditions can be caused or made worse by excess weight. As for Anne Roberson, she says the extra weight she has long carried around on her petite frame has begun taking a toll on her joints, her sleep and her mood. On a recent morning, Roberson listened politely to Dr. Mylene Middleton Rucker, her longtime physician, during her first Medicare weight loss counseling session. Rucker suggested she eat more vegetables and less meat and encouraged her to join a local exercise class. Rucker, who is obese herself, says she doesn't expect her older patients to lose a lot of weight. "I think you'll see weight loss of 10 to 20 pounds, but whether you're going to see people lose 50 to 100 pounds as they're older, I doubt it," says Rucker. Still, even with small amounts of weight loss, Rucker expects to see a decrease in the complications of chronic medical diseases, including diabetes-related leg amputations. Roberson has tried to lose weight before, but it was hard. "You hit a couple of rough weeks and you kinda slough off." This time, Roberson says firmly, she will have to come back and answer to Rucker. That accountability, Rucker says will help her lose weight.